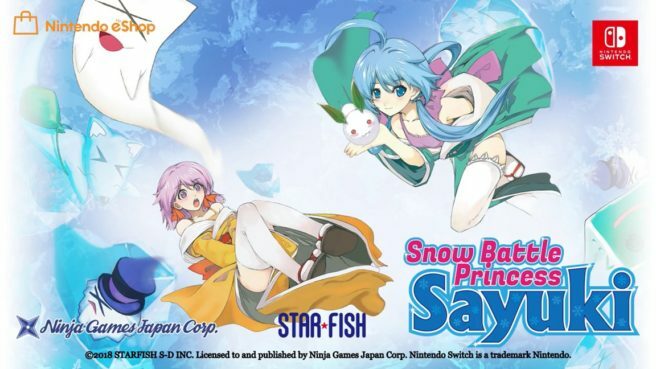 Ninja Games Japan and Starfish will release Snow Battle Princess Sayuki on Switch next week, according to eShop listings. The title’s launch is set for March 28. Help Sayuki, a snow princess, break an evil curse set upon her loved one by finding 8 items scattered across 8 lands. The treacherous journey will take you across Blizzard Mountain, Monsters Castle and Hells Valley where you will encounter many mysterious yokai monsters. Use Sayuki’s ability to control elements made from water to fight off the swarms of monsters with her icicle blast attack. Collect different color crystals to change and powerup the type of shots such as rapid, three-way and homing. Do battle against various types of enemies including mummies, witches, comical ghost lanterns and amazing yokai monsters! Go head-to-head with giant boss yokai enemies that lay in wait at the end of each level. Use the special Blizzard attack to freeze the yokai monsters in one fell swoop and chain together attacks for great effect! Play alone or cooperatively with a friend who takes on the role of Sayuki’s sister, Koyuki. Collect the snow fairies hidden across the 8 lands to unlock Boss Attack mode for single and multiplayer. Pricing for Snow Battle Princess Sayuki is set at $15. It’s currently available for pre-load on the Switch eShop.